The release of Vintage Vocal Swing, our new album available from Audio Network, gave us the opportunity to produce a stellar cast of musicians and record them at Abbey Road Studios. We had written seven songs that were crafted to sound like they had come straight out of the 1930s and forties. Our plan was to compose the sort of music that seems to have been around for practically ever, but actually hasn’t. The recordings have benefitted from the input of some fabulous musicians. The band line up was Colin Good (piano), Ant Law (guitars), Tom Farmer on bass, Mike Smith on drums, Mark Crooks (clarinet), Howard McGill on alto sax and flute, Phil Todd (tenor sax and flute), Malcolm Earle Smith (trombone) and Enrico Tomasso on trumpet. We’ve been lucky enough to work with most of these virtuosos in the past, so we knew we were in for a treat. 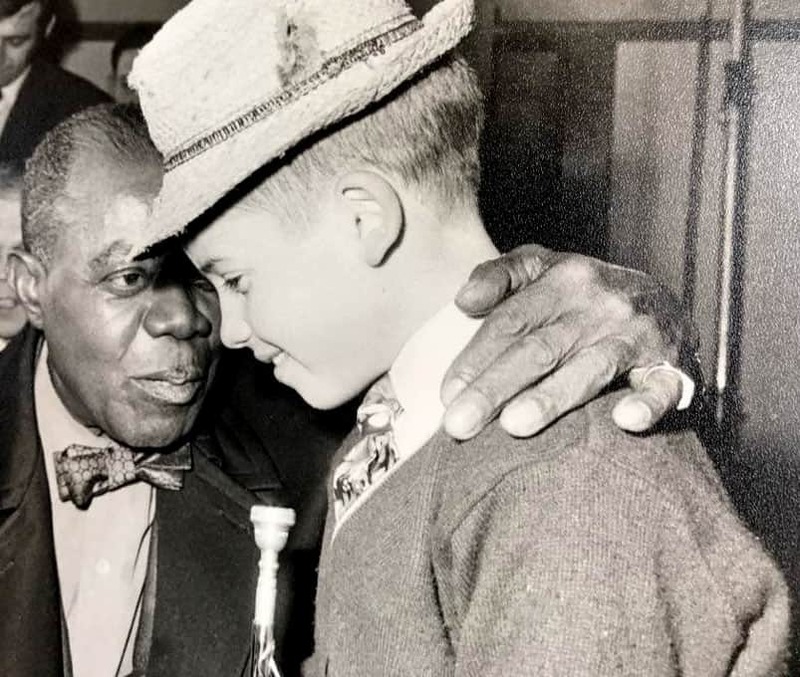 A six-year-old Enrico Tomasso with Satchmo in 1968. These guys were instrumental, sorry – couldn’t resist that – critically important in achieving the kind of silky-smooth sound that we wanted. Enrico is one of the UK’s top trumpeters. His dad Ernie was a professional clarinettist and Enrico’s lineage goes all the way back to a childhood performance with Louis Armstrong, which makes him jazz royalty in our book. The rest of the band are luminaries in their own right and specialists in music of the pre-war period and the 1940s. The boys did their work in the morning in the intimate surrounding of Abbey Road’s Studio 3, and the vocals were recorded in the evening of the same day. In for a penny, in for a pound, we decided to get fully in the mood (see what we did there?) by donning period outfits from the 1940’s. David made a dash as an RAF sergeant while Jeff was zoot-suited and booted in the height of forties fashion. Vocals were in the expert hands of Joanna Forbes L’Estrange (former MD of five-times Grammy Award winners The Swingle Singers). Joanna, who also composed the tracks with us, was joined by Sara Brimer-Davey and Joanna Goldsmith-Eteson. For three hours of recording they channelled (and modelled) an Andrews Sisters style that complemented the compositions beautifully. Audio Network’s Sébastien Daniell was on hand to film the proceedings and put together the video above. Our thanks to Séb for capturing the event and producing the video – and to all the team who contributed to the recordings. All That We Dreamed Of – Twee tea-room jazz with sweet harmonies over a laid-back rhythm section. 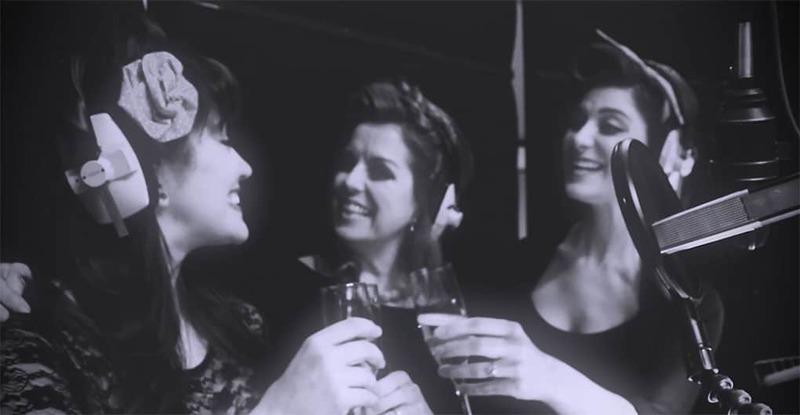 Choo Choo – A fast boogie groove with close-harmony female vocals. Tell Me That You Love Me – Up-tempo 1940s swing with close-harmony female vocals. Stop The Search – A swinging piano and big band boogie woogie. You Are – A lovely vintage romantic jazz ballad. 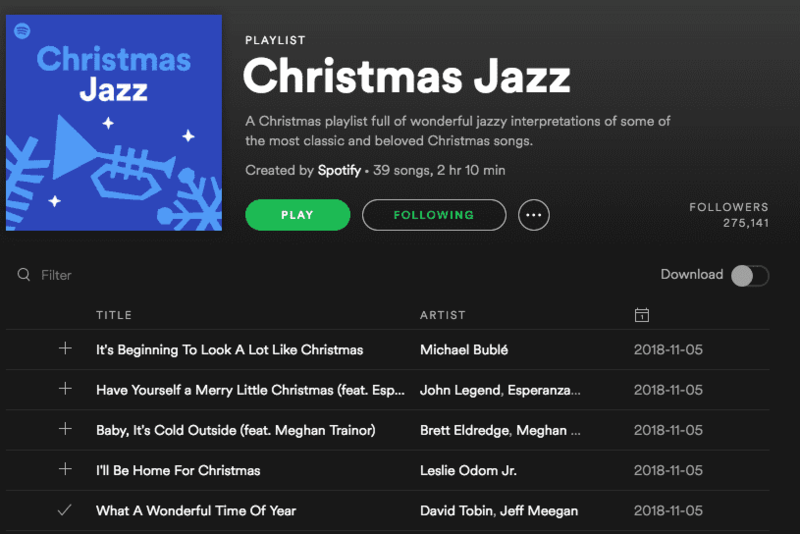 Hurry Santa – a cheerful Christmas song with a jazzy vintage feel. 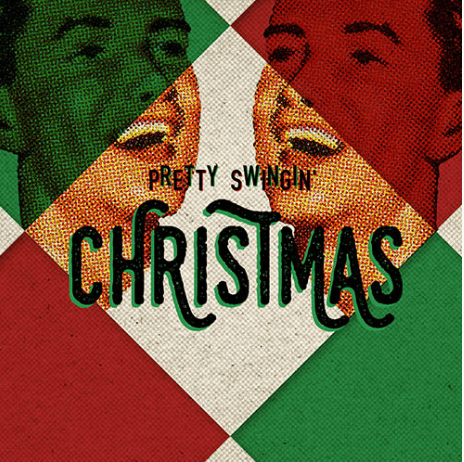 A swing album par excellence. Silky songs with brilliant big band backing.